There is nothing simple about the 1910 General Industry Standards. With more than 17,000 safety laws, compliance can be overwhelming. ISTS offers solid expertise in health & safety training so you can go back to the business of running your business. We make workplaces safer, employees ready, and compliance uncomplicated. OSHA training is becoming mandatory in more states and industries every day. The OSHA Outreach Training Program provides training for workers and employers on the recognition, avoidance, abatement, and prevention of safety and health hazards in workplaces. The program also provides information regarding workers’ rights, employer responsibilities, and how to file a complaint. This is a voluntary program and does not meet training requirements for any OSHA standards. 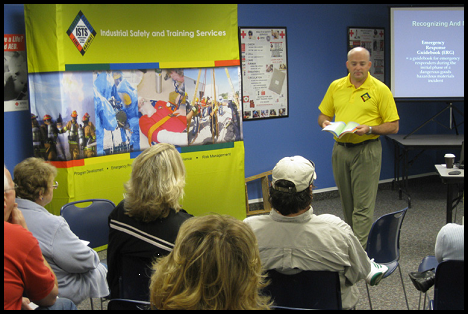 Through this program, workers can attend 10-hour or 30-hour classes delivered by one of our OSHA-authorized trainers. The 10-hour class is intended for entry level workers, while the 30-hour class is more appropriate for supervisors or workers with some safety responsibility. Through this training, OSHA helps to ensure that workers are more knowledgeable about workplace hazards and their rights, and contribute to our nation’s productivity.